Hey, look at that! I got new cards! I’ve been wanting my own cards for a while. Though, I already sort of had cards. I mean, I’ve had my “fixer” cards—they just say “FIXER” on the front and have my email address on the back—as a joke for a couple years years now. And of course I’ve got my cards for when I introduce myself as editor for TwinCitiesGeek.com. 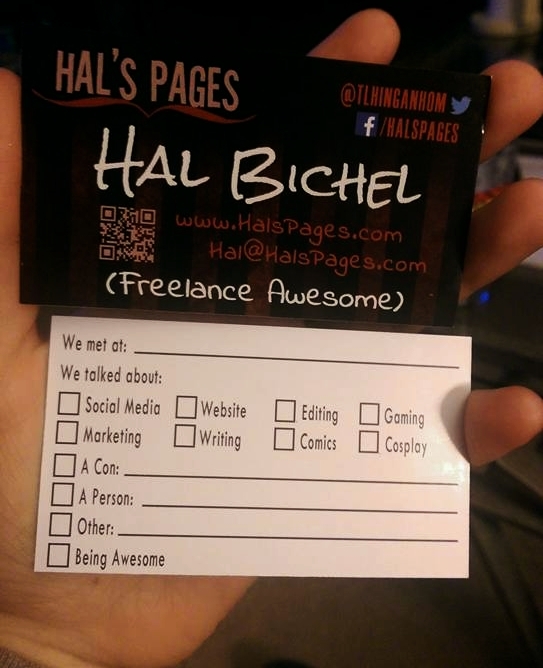 But I was missing a card for the thing I do most; generally introducing myself at conventions without the context of an in-joke or the local geek website I run. Your brand is your brand. Don’t try to be a different brand. That is of course marketing jargon for, “be yourself”. Isn’t it funny how you can preach good advice to others until you turn blue, but still sometimes have to remind yourself? So I did just that, and have adopted the moniker “Freelance Awesome”. It’s my way to say I can do just about anything well, but I definitely don’t fit into any kind of existing mold professionally or personally. And it’s powerful personal branding too, because it’s both confident and memorable. So, hey, why not? Folks collect so many flyers, literature, and cards, and talk to so many people, it is far from guaranteed they’ll remember who you are or why they were talking to you by the time they finally get home and unpack. Even if they do remember, it’s still pretty likely they’re going to simply toss out your card. Now, there are other ways to deal with these challenges than what I’ve done. The most common thing to do is include a photograph or a piece of art on the card. This is a simple way to add context and encourage an emotional connection, making it harder to drop in the trash. It makes a lot of sense for models, performers, cosplayers, or artists to do this. Another trick I’ve seen used to address these challenges is to add download codes or even a joke to the card, which gives it a tangible value. This could make sense if the download code is to a piece of your work, or if you are a comedian and the joke itself is a piece of your work, because the whole point of the thing is exposing the person to your work, which either is going to sell itself to them on merit or isn’t. But I don’t fall into any of those categories. I provide services—primarily marketing consulting for creatives, but also content writing, blogging, editing, websites, social media management. So I don’t have any product per se I can lean on for my cards; I’m all about getting others’ stuff seen. However, I do have my personal brand. If you’ve ever talked to me when I’m actually “on”, you know that’s not insignificant. And that’s why the back of my card is what it is. My strongest asset is, well, me and what I can do. So the little form to fill out on the back of the card is a way to remind a person of that by providing context for a conversation we had. Also, generally a person is less likely to flippantly toss out something with writing on it. Of course, if everyone adds a form to the back of their card, that’ll probably change and I’ll have to think of something else to stand out. So I guess I’ll just have to try to give out this whole box of cards before that happens. I’m not really worried either way.